Bulawayo Vocational Training Centre situated in Nguboyenja Surburb in Mzilikazi Bulawayo is the foundation and the oldest of all Association’s establishments. 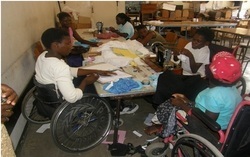 The centre treat, assist and rehabilitate men, women, boys and girls with disabilities by equipping them with various skills. Bulawayo Vocational Training centre is registered under the Ministry of Higher Education and Technology and offers training in Clothing Technology, Computer Programming, Electronics, Refrigeration, Welding, Business Studies, Wood Technology, Basketry, Leather Craft, and Secretarial Studies. The courses offered empower trainees with skills for both formal and informal employment in various economic sectors. Occupational therapy, Independent living, outreach and Follow up Integration programmes are carried out by the centre with the support from the Community Rehabilitation Programme. Bulawayo Vocational training Centre has over the years produced many respectable citizens, some of whom are graduates of our local universities. Students also have access to regular rehabilitation services within the institution and participate in various sports and recreational activities. Students at the centre are taken once a week for physical exercise by the physiotherapist.